Dhaka University has published an ambitious volume commemorating the Year of Physics! The volume includes Einstein's seminal 1905 paper on the special theory of relativity, along with Bose's 1924 paper on quantum statistics and its Bengali translation. Our Alma Mater: Celebrating the Hundredth Anniversary of the Birth of the Theory of Relativity, Edited by A.M. Harun-ar-Rashid, celebrates the founding of Dhaka University, and the role it played in the history of physics, as well as the history of Bengal and Bangladesh and its intellectual contributions. While Bose's work, and his relationship to Einstein, anchors the book, there appears to be a lot of other interesting articles by various writers in Dhaka. The price tag of US $100 (!!) seems quite steep, especially in countries like India and Bangladesh, and seems to make the target audience quite limited. There is also an article by my uncle Rathindranath Bose, Satyen Bose's eldest son, which I will try and get a copy of and post to the S N Bose Project website. Dr Partha Ghose, a student of Bose, wrote a review in the Telegraph (Kolkata) which appeared on 28 September 2007. We contacted Dr. Ghose and inquired about his article, and he was gracious enough to provide us with a longer and more detailed version. Dr. Ghose's writings are informed and detailed. He has been one of the people whose work has made valuable contributions to Bose scholarship over the years. We thank him for allowing us to post the longer version below. The Dhaka Physics Group have recently published ‘Our Alma Mater’ (From Bose-Einstein to Salam-Weinberg and Beyond) in celebration of the hundredth anniversary of the birth of the Theory of Relativity. This 443 pages hard bound book contains a variety of articles, starting from the classic 1905 paper of Einstein on special relativity, Satyendranath Bose’s revolutionary paper of 1924 on quantum statistics together with a Bengali translation, an article on the famous Tagore-Einstein dialogue on epistemology, articles on how the University of Dhaka came to be established, the development of physics at Dhaka, reminiscences of the Curzon Hall (a beautiful building in which the Physics Department is housed), and some recent writings of Curzon hall alumni on diverse technical subjects such as cosmic strings, collapsing matter and wavelets as well as popular accounts of Einstein’s theories and astrophysics. A Bengali translation of Satyen Bose’s paper on the light-quantum hypothesis is welcome as it can dispel many misconceptions among laypersons about the content of this revolutionary paper. Many still believe Bose made an important correction to Einstein’s equations of relativity which Einstein admitted! That it was not so but an outstandingly original and novel contribution to quantum theory of light which only Einstein recognized in the beginning, accepted and extended to other areas of physics, is hardly known. However, the translation that appears in the volume is a stiff literal one that one has to plod through. Tagore wanted to set an example of scientific writings in Bengali through his Visva Parichaya dedicated to Satyendranath Bose. He attempted to create a scientific literature in Bengali. Some of Satyen Bose’s essays in Bengali on scientific topics carry a definite literary flavour. This translation of Bose’s paper is very disappointing from that point of view. Professor A. M. Harun ar Rashid’s piece on the Tagore-Einstein dialogue is a valuable addition to Bengali scientific literature, although it is not clear why this article has found place in this volume because it has nothing to do with the Dhaka University except in so far as it contains reflections on an important subject by a distinguished alumnus of the University. As a backdrop of the dialogue, Rashid explains the epistemological positions taken by a scientific realist like Einstein and contrasts it with the position taken by the positivistic Copenhagen School led by Niels Bohr on the question of the nature of physical reality as described by quantum theory. Einstein believed in a world ‘out there’, governed by strict causal laws and independent of our minds and existence. It is a metaphysical belief. The job of science is to capture this reality as faithfully as possible by observation/experimentation and reflection. Rashid has missed the point altogether. First of all, the word ‘appearance’ has been translated as vahyaroop (external appearance) by him, which is questionable. Rabindranath clarified what he meant by the word appearance: “that is to say, what appears to be true to the human mind and is therefore human …” and there is no hint of any externality in this. This is true of all scientific theories. According to Einstein himself, no scientific knowledge is possible “without free conceptual construction” (Autobiographical Notes, p. 49 in Albert Einstein: Philosopher-Scientist, vol 1, ed. P.A. Schilpp, Harper Torchbooks, 1949). This is why scientific theories change as new facts are discovered that cannot be fitted into the existing theory. In any case, Tagore was not pronouncing any final view of reality at all. All he was saying was, no matter what, the scientific concepts, whatever they may be, are those of man, and therefore human. He was not rejecting science at all, only pointing out the essential role of the human mind in scientific discovery. Einstein, on the other hand, simply held on to his metaphysical belief in an extra-human aspect of truth, something he admitted he could not justify and later called “objective reality”. Let me quote Abraham Pais, an eminent physicist and a biographer of Einstein, on this very issue: “Tagore could not accept this view. Neither can nearly all modern physicists, but for quite different reasons. This issue was also central to the dialogue between Einstein and Niels Bohr who like most of us, could not accept Einstein’s opinion – not on philosophical grounds but on physical grounds.” (A. Pais, Einstein Lived Here, Clarendon Press, Oxford, 1994, p. 105). So, Tagore’s foggy “unclear” Indian philosophy is not so different from modern physics in its final conclusions after all. The language of a poet, particularly like Tagore, is often designed to be elusive and suggestive in order to point to a deeper reality that transcends our naïve commonsense notions of reality. This is where Tagore found a similarity between his philosophy and modern physics, particularly relativity and quantum theory which reveal a reality beyond what appears to be true to our five senses. He was fascinated by it and called it the vaijnanik mayavada of modern science (Bhoomika, Visva Parichaya, Visva-Bharati). Ajay Ray’s article on the Hartog-Satyen Bose letters is historically very valuable. 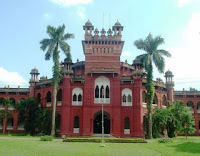 It records how Bose came to be appointed by the Dhaka University, the difficulties he faced in relation to his salary, how he stuck to his principles leading to the formation of the Bose Committee, and how eventually not only were all his demands met by the University, he was given a two years study leave to go to Europe with a loan of Rs. 13,800 on the basis of a postcard he received from Albert Einstein thanking him for his important contribution to the quantum theory of light-quanta. Bose had hit upon this remarkable discovery while going through a period of financial uncertainty and mental strain. Other articles of historical value that have found place in the volume are Abdus Salam’s “Nuclear Physics in Pakistan”, S. R. Khastgir’s “Polarization of Ionospherically Propagated Radio Waves”, R. C. Majumdar’s “Dhaka Visvavidyalayer Katha” Tagore’s address at the Dhaka University on “The Rule of the Giant” and Rathindranath Bose’s “Visvapadartha Vidyavarsha O Vijnanacharya Satyendranath Bose”. One learns from other articles in the volume how apart from S. N. Bose’s outstanding work, very important contributions to physics were made in Dhaka by K. S. Krishnan, Kedareshwar Banerjee, S. R. Khastgir, and others. The University had other stalwarts like Sir J. C. Ghosh in the ChemistryDepartment and R. C. Majumdar in the History Department. Later Majumdar became the Vice-Chancellor of the University. A glorious record indeed. Unfortunately, the volume is somewhat marred by many typographical errors. This is a question for the webmaster/admin here at blog.snbose.org. May I use some of the information from this blog post above if I give a link back to this site? Can I use some of the information from your blog post above if I provide a backlink back to this site? I have a message for the webmaster/admin here at blog.snbose.org.